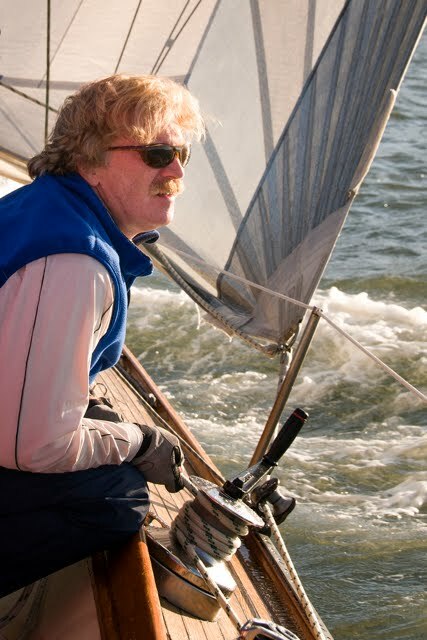 If you’re a sailor and happen to be sitting at your computer right now, do something that would put a smile on Rob Moore’s face: go to http://cyc.org/race/midwin, and sign up to race in the inaugural Rob Moore Regatta being sailed as a special race within the Corinthian MidWinter Regatta on February 16. If you’re not a sailor and you’re reading this, chances are that at some point your life has been touched in some way by lung cancer so keep reading to learn how the Marin sailing community has come together in honor of one of its treasured sailors who passed away last year at age 58 after losing the battle with lung cancer. 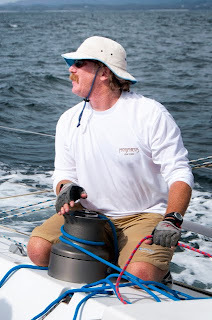 Moore was a highly regarded sailing journalist and skilled yachtsman who loved sailing and made a significant contribution to the organization and success of many sailing regattas locally and elsewhere. While working in finance he began writing about local sailing events for a variety of publications, joining the Marin-based sailing magazine Latitude 38 in 1986 as a full time journalist where he worked until his retirement in 2005. Moore became an honorary member of the Corinthian Yacht Club in 1993 and for the next 20 years put particular effort into developing its mid winter racing series which stands today as the oldest mid winter series on the Bay, running continuously since 1951. It’s always held on the middle weekends in January and February. John Colver, a CYC historian and a regular in the series since 1964, noted that in earlier days the popularity of the event was such that 200+ entries was not uncommon. However as the ‘90s rolled around interest in the event began to languish - about the time Moore came along. 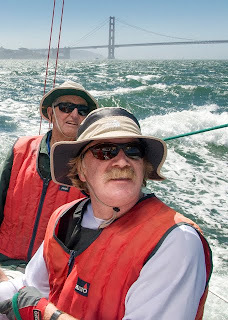 Colver and his wife of 52 years, Rosalind do a lot of serious racing during the regular seasons on their Schock Harbor 20, so enjoy the respite of winter sailing on the Bay and the post racing camaraderie at CYC. Winter winds are different, which makes things a little more unpredictable on the water but typically the breeze is lighter which takes the stress out of racing for those who want to, well, just chill. Additionally, CYC have a very large non-spinnaker division, which is appealing to people new to racing, and those who don’t want to beat up their boats. “Mid winters were always meant to be a fun regatta for those people who get a bit stir crazy during the winter,” Colver said. Moore is missed plenty and especially by his long time friend Hank Easom, who is trying his darnedest to get the green light from his doc following a hip injury so he can race on February 16. In the spirit of its namesake, the Rob Moore Memorial Regatta, as part of the CYC MidWinter Regatta, hopes to support San Francisco Bay sailing with an event that’s inclusive, and offers serious but fun racing, as well as to raise awareness and funding for lung cancer research. The post-racing program includes a live auction, dinner, live music and a presentation by Stan Honey, Director of Technology for the 34th America’s Cup. * As stated on the website www.bayarearacingfederation.org, Moore was among the 20% of lung cancer victims with no history of smoking, and no other known environmental risks. He personally supported the National Lung Cancer Partnership, an organization that supported him and his wife Leslie Richter throughout his battle. It was his wish that his family and friends use his experience to continue to raise awareness of lung cancer and fund research into early detection and treatments. * A new race sailed within the Corinthian MidWinter Regatta. * February 16, 2013, with warning signal for the first race at 11:55am. * Scoring is done time on time, and all races count. The Rob Moore Regatta will be scored by itself for the daily trophies and a new perpetual trophy in memory of Rob, but will count toward the overall CYC midwinter results. * Trophies: Divisional trophies, Rob Moore Perpetual Trophy, Best Performance, Best Corinthian, and the Aotea Team Trophy, for best performance by three boats from the same yacht club.